I am trying to figure out how you put your lovely poems together to post one just about everyday, sis,…this one really took its time deciding how it would flow on the paper. Sheesh! Alas, it was/is a great writing exercise so will attempt to do more in time. Well, I write poetry in “bunches” or “batches”, it seems–as the Spirit moves me–and that way I can schedule them daily (except for the occasional “prose” days). I’m looking forward to more from you!! 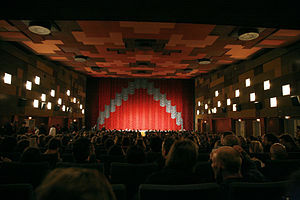 Well, I borrowed the photo from Wikipedia as our theater is an open stage…haha, but the memory loss is real. I think the brain shuts down for some odd reason but reactivates once the lights hit on…lol, probably doesn’t want to miss the big encore or is trying to avoid hearing boos and hisses if it remains dormant! !